With the weather of the last few days being fairly awful, there hasn’t been a lot of people fishing, but there have been a few bright spots for those willing to brave it. 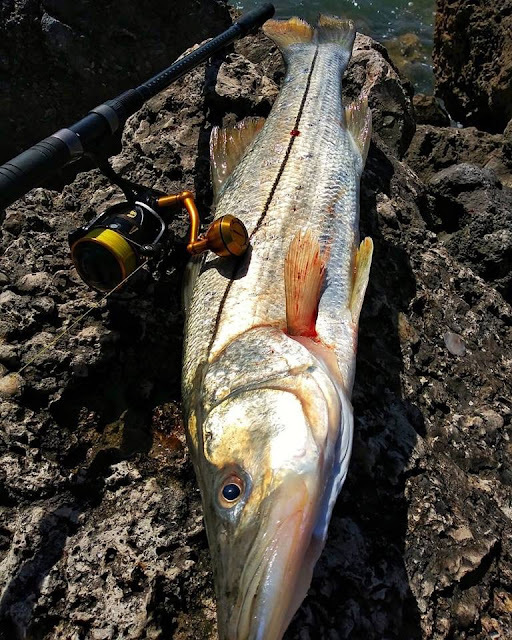 Snook fishing in the inlets has been good, but mostly on live bait, and Kingfish have been prolific to the south. In the Indian River, there have been quite a few Redfish around still, even with sight fishing conditions being less than optimal. Blind casting shorelines with DOA CALs and jigs have paid off the best. Seatrout are also being caught in good numbers, and the cooler weather should only help that. March has always comes in like a lion! You can expect windy days, but much warmer as we transition into spring. Chances of rain are on the increase so watch the weather and plan your adventures carefully. Water temps will be on the rise this month and you can expect lots of exciting action around the Treasure Coast. Trout will be moving onto the shallow grass flats as the sun warms things up. Try a DOA Deadly Combo or live shrimp on a popping cork to locate trout. A DOA CAL will also work well this month. 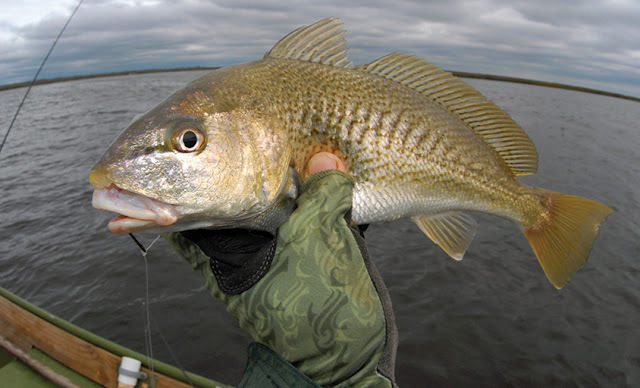 Look for redfish to be around mangroves and docks. A DOA shrimp is always a good choice for reds. Sheepshead, drum and snapper will be along channel edges and docks and willing to take a live shrimp. Snook fishing will pick up around the inlets, bridges and docks. Live pilchards are a favorite bait in March. Mackerel, bluefish, jacks and many other predators will be coming in with the tides and feeding around the inlets and channels of the river. 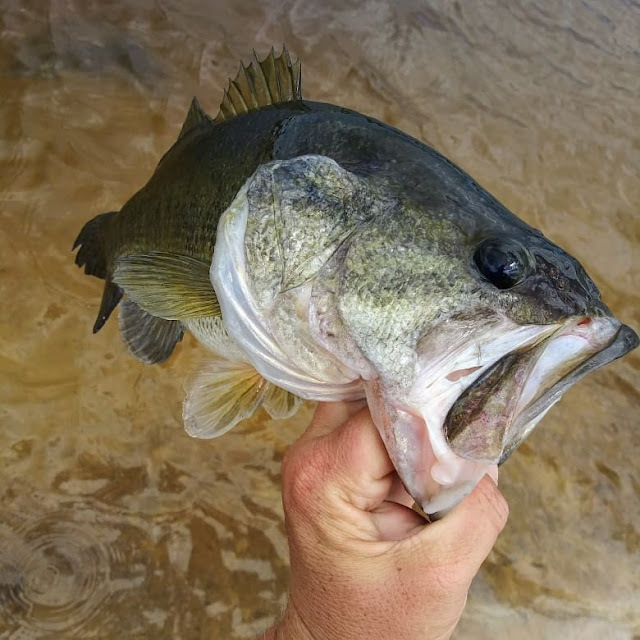 Small shiny lures work best for these fish. Spring is almost here already. Winter wasn’t so bad even though we complain about it. It’s a good time to check equipment. 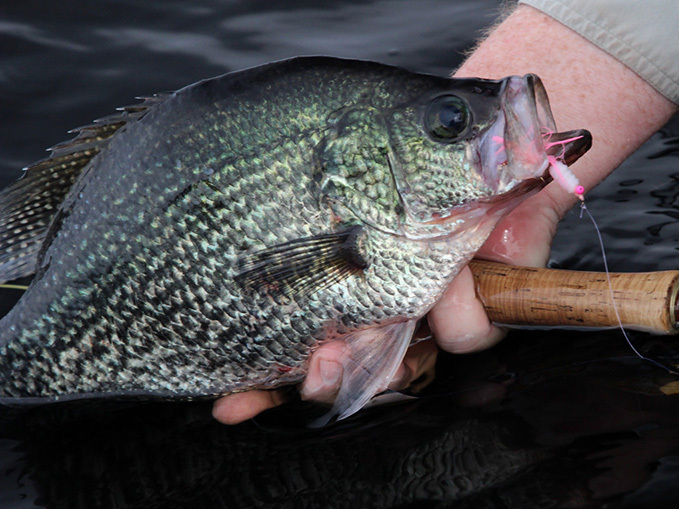 Both fishing and the boat should be checked a few times a year to make sure everything is in good working order. Some of these windy days will provide a good chance to check rods, reels and safety gear for when good weather arrives. A LITTLE BIT OF EVERYTHING…SPANISH MACKEREL, BLUEFISH, BLACK DRUM, POMPANO, GO FISHING AT THE INLET! 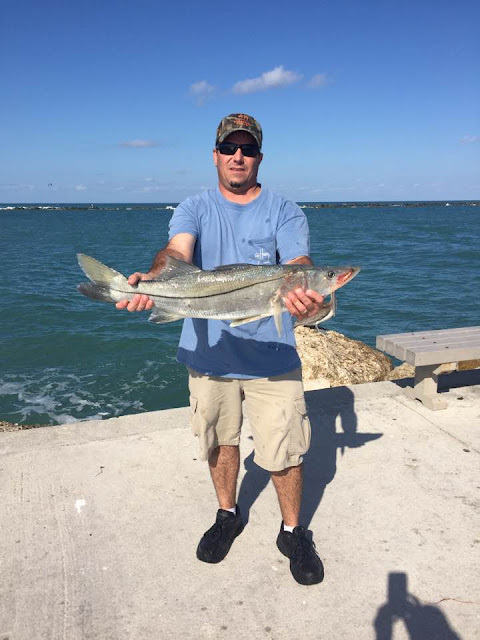 Our friend Tommy Turowski at Sebastian Inlet Bait & Tackles has been seeing a whole lot of Spanish Mackerel and Bluefish, off both the North and South Jetty. Got-cha lures and silver spoons haven been working great. 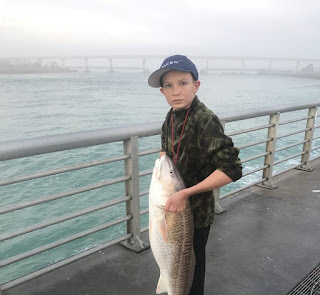 Anglers have been reeling in some Jacks, Redfish, Black Drum and Snook off the North Jetty and throughout the inlet. Biting mostly on live or frozen shrimp and cut bait. The Sheepshead bite has been great and we know winter when the water is cold is a great time to target them. Pompano, Whiting and Bluefish are being caught off the beach. Two hook bottom rigs are bringing those fish in for our shore anglers. Bluefish are hitting silver spoons off the beach. From all the reports we have been getting, fishing has been consistently great in the last few weeks! 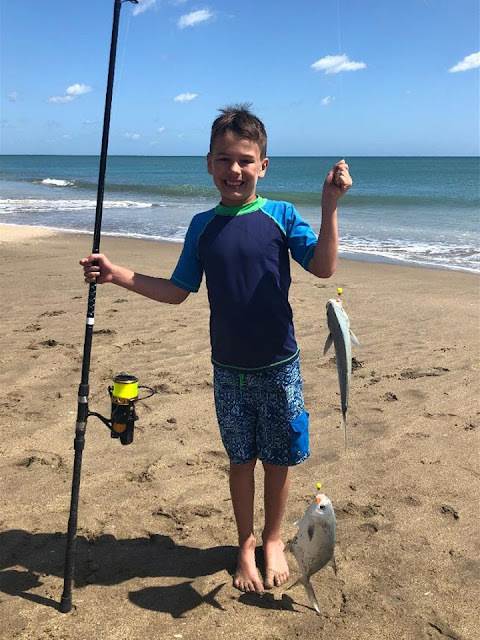 Today we’re sending out a special thanks to Jim Stafford and his friend Garryn from Cocoa Beach, our featured angler of the week. 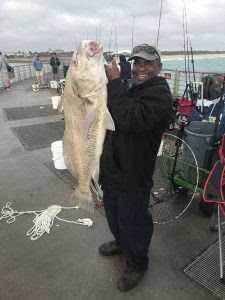 Garryn is quite the upcoming fisherman and has been named “King of the Jetty” by his fellow anglers. Everyone who knows him says he’s on his way to becoming a legend at the inlet! 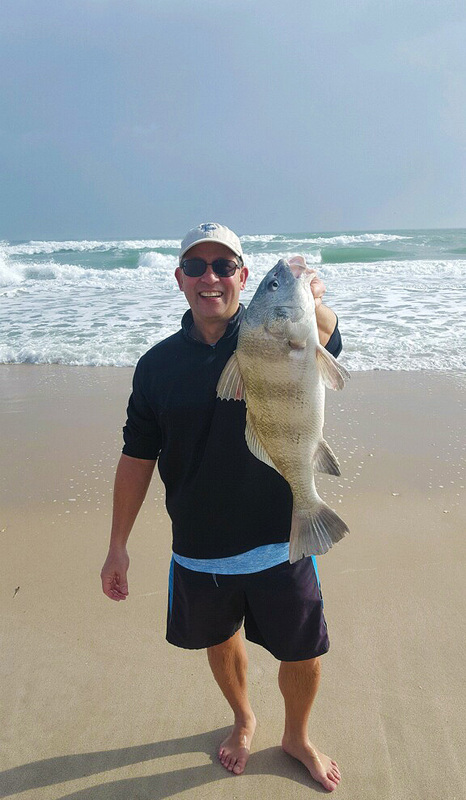 Jim tells us that he met Garryn and his family on the North Jetty and that Garryn has been giving him fishing tips. We’ve included a couple more pictures here; Gordon Robinson of New York and Ike with his 60 lb. 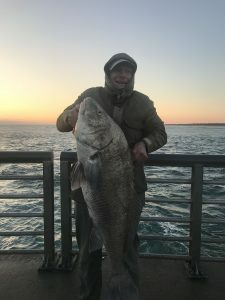 Black Drum, all caught off the North Jetty. Another update from our friend Ed Killer at Treasure Coast Newspapers.. NOAA Fisheries has decided to open a season for Red Snapper this year for five days this summer. July 12, 13, 14, 19 and 20 are the dates recreational anglers will be able to harvest one Red Snapper per person, per day. Southeast wind that is predicted will give everyone a chance to look for some pompano, whiting, croaker, and bluefish. The anglers fishing the bridges and flats in the area had a good week locating and catching the pompano and those of us that will be looking for that species should put a few in the cooler from the sand. It appears the strong winds that kept us off the beach last week from the northeast did not change the water clarity and as of yesterday the water was a nice color at most locations. 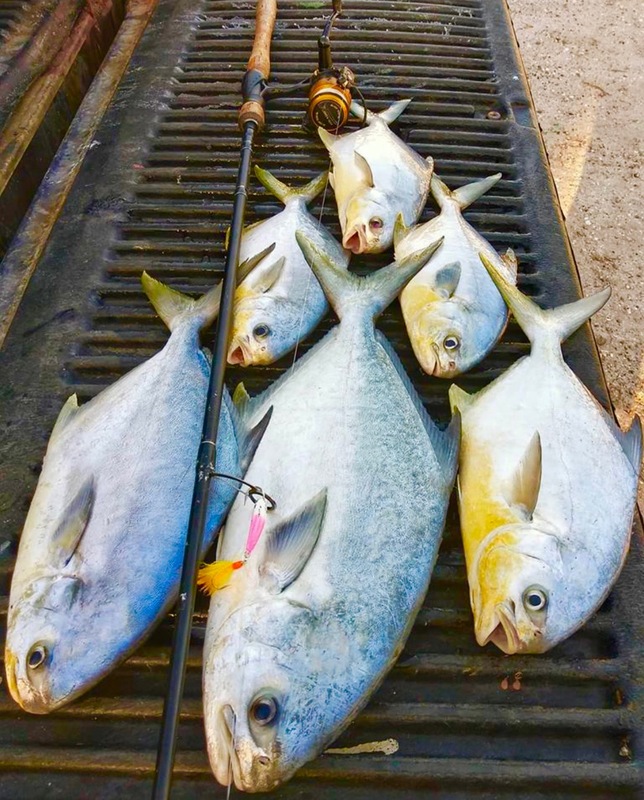 The strong pompano bite usually changes to late afternoon in the spring and with the extended sunlight things should get good. A quick Fishbites tip to pass along is I have been hearing from numerous anglers about the good whiting and croaker action using the Bloodworm scent. 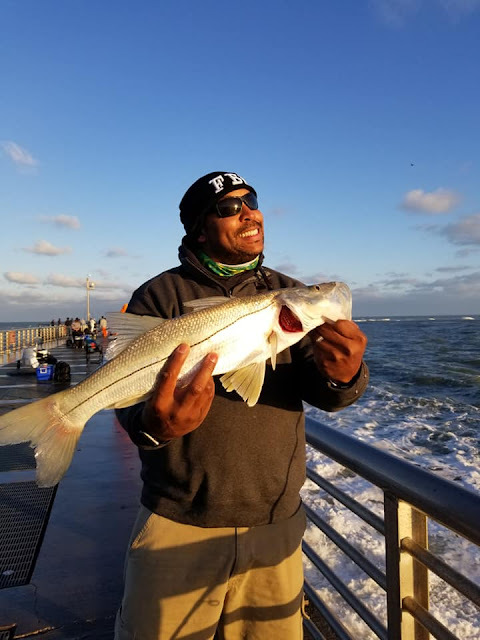 This bait is known for catching Sea Bass and Ling in the New Jersey area and is now putting numbers of whiting and croakers in anglers coolers in our area. I have a couple of bags in my tackle bag and will be using some this weekend. The challenge for trying this bait is availability because I don't know if any tackle shops in our area have a big inventory. Fred has some on the shelf at The Snook Nook and Bass Pro has a limited supply also. 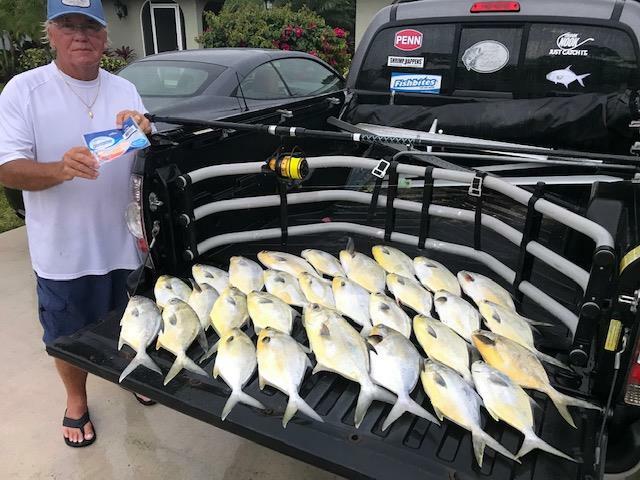 A final note that I am happy to report is the increased presence of FWC officers in our area and an increase in tickets to the small group of fishermen that ignore regulations , especially those who target pompano. I am happy to see FWC on the beach and in the parking lots and for the 95 per cent of us that play by the rules, I am sure you are too. I take a minute when I see the officers to thank them for being there . 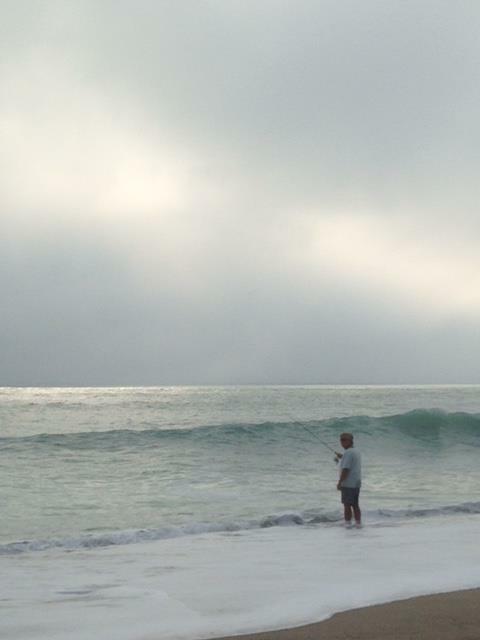 Surf fishing was pretty darn good this past weekend at a lot of different locations. Tiger Shores, Stuart Beach, Santa Lucea, and Bridge Road in Hobe Sound all had some great action for bluefish, whiting, croaker, bonefish, and jacks on Saturday and Sunday. 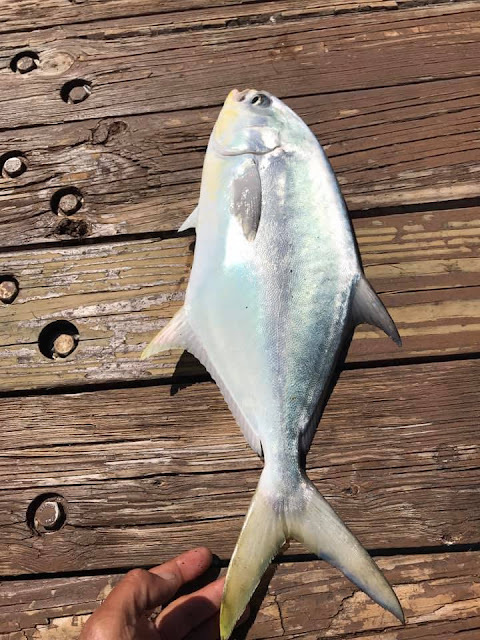 I was not able to fish on Saturday but the reports I received from friends that were able to wet a line told of a fantastic afternoon pompano bite at Tiger Shores and Bridge Road. Fishbites and natural clam strips were the hot baits. The morning activity at most spots provided some action but nothing near to the numbers that were taken from 3 to 6 pm. 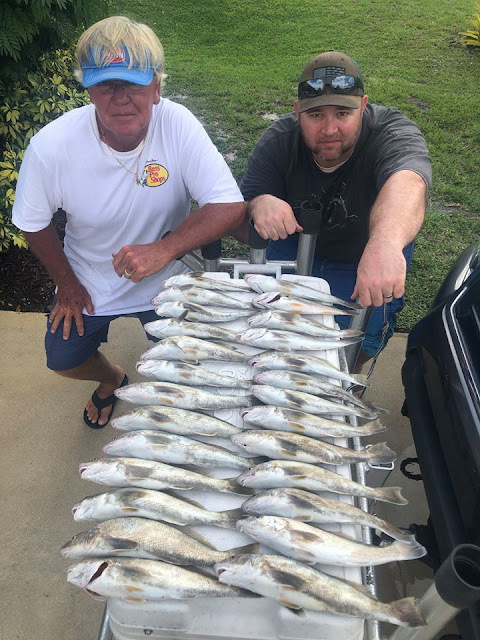 I met my son Randy at Tiger Shores on Sunday morning and the pompano bite had slowed somewhat but we managed to put 11 in the cooler along with some bluefish, whiting, croaker, and had fun with some catch-and-release bonefish. I took a ride today to Hobe Sound after getting some reports about a great pompano bite there on Sunday afternoon. The results from today reinforce the fact that the biggest challenge with pompano fishing is not catching them, but finding them. I managed to put a couple in the cooler early, but that was the end of the activity. 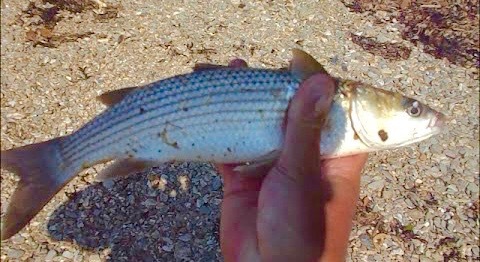 The bite totally shut down at most of the spots that produced on Saturday and Sunday and I ended up fishing all the way up north at Blue Heron and only put 5 or 6 whiting in the cooler. Fellow surf angler, Brian Morris, stopped by and reported some whiting and 1 pompano at Normandy beach but overall it was a very slow day. It looks like we are getting a cool front at mid-week that will probably make conditions a little tough on Wednesday, but the wind is forecast to back off at the end of the week and into the weekend. Fishbites, clam strips, and sandfleas should all be included in your bait supply as they produced all of the action this past weekend. In the St. Lucie River the pompano fishing has been fantastic. In the Hells Gate and Sailfish Flats areas, as well as along the bridges, anglers using shrimp on a jig head or goofy jigs are doing great. 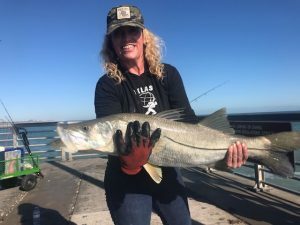 There has been good numbers of pilchards and greenies around at the St. Lucie Inlet and some of the docks which has made for good snook fishing. Both pilchards and greenies are the go to baits. If you’re not catching your own check out Stuart Live Bait in Manatee Pocket to pick some up. Along the beaches in the Jensen area there are pompano to be caught, but also plenty of whiting and croaker. 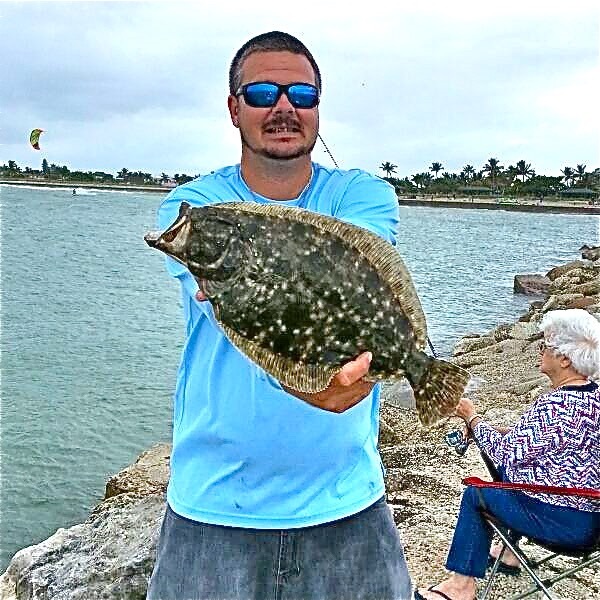 With the north winds on Wednesday and the northeast to east winds forecast for today, the pompano fishing should be good from the dredge on Jupiter Island south to the inlet. The winds should keep the water slightly stirred and ‘milky.’ Goofy jigs are working well with the key being to hop them along slowly and close to the bottom. If using natural bait, sand fleas and clams are producing good action. 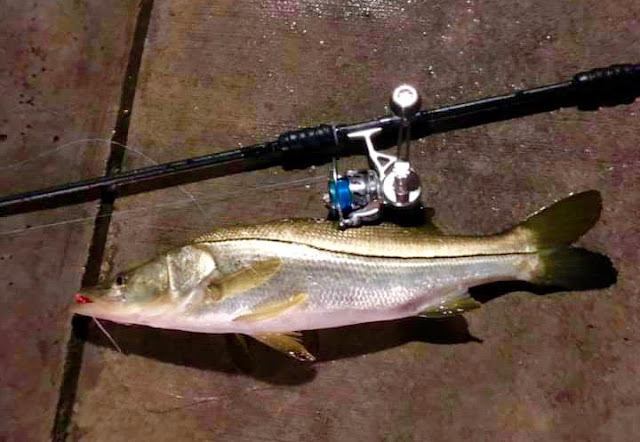 Though there haven’t been any reports of the snook action going wild in the area, they are being spotted in good numbers around the inlet and along bridges and docks. 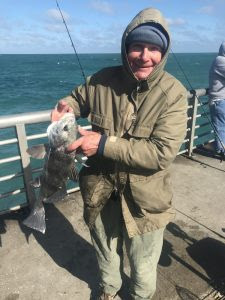 Fishing at the Boynton Inlet has been slow with light action on sheepshead and mangrove snapper. 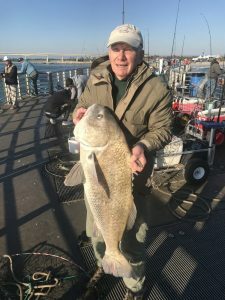 Anglers working the Lantana Bridge have been doing well on large sand perch, black drum and sheepshead using cut shrimp, live shrimp and live crabs. Though the action slowed down on Wednesday with the cooler weather it should pick right back up. The bass fishing has been excellent just inside the mouth of the Kissimmee River. Anglers using live wild shiners and working the edges are having a blast. If you’re going to try and fool them rather than feed them, flippin’ Senkos has been the best bet lately. The spec bite has backed off a bit, but should also pick back up with the warming trend. We will post when they get here. 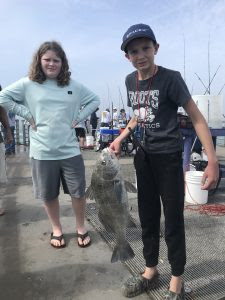 Inshore the sheepshead and black drum bite continues to be good along with a good croaker bite. 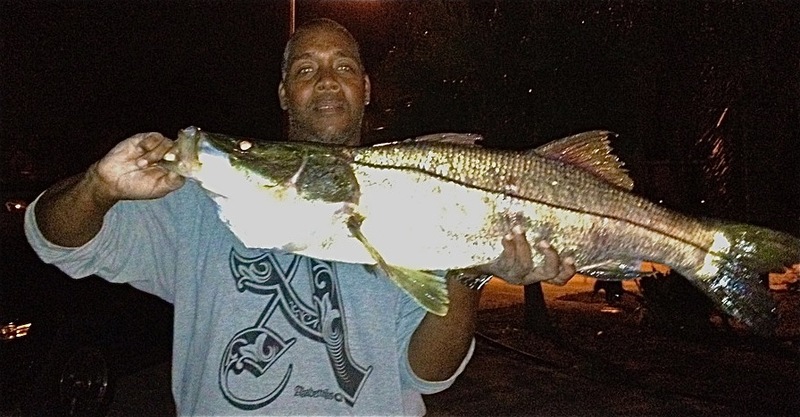 There have been some keeper snook caught at the North Bridge, at the jetty and in the Ft. Pierce Inlet. The jetty has been producing the usual catches along with a few nice flounder. The surf is full of whiting.